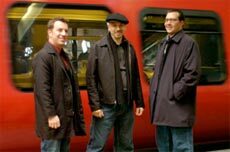 "Simply a with it, happening piano jazz trio, they don’t pander but they play to please... Tasty to the point of savory, this is where your ears want to be at the end of a long, noisy day. Solid stuff throughout." Some stuff is just plain right. Originally meeting as Curtis Stigers back up band, this crew has taken on a life of it’s own and is now on it’s fifth album in 10 years. Simply a with it, happening piano jazz trio, they don’t pander but they play to please. Echoing any or all of your fave straight ahead piano trios of the past, these are all solid players that don’t need to go for pyrotechnics as their quiet fire lights the way well past the usual pas de trios. Tasty to the point of savory, this is where your ears want to be at the end of a long, noisy day. Solid stuff throughout.